One of the things I really like about sports is how one season ending and the start of another really marks the time. As football winds down and MSU Basketball ramps up in earnest with the Spartan Men&apos;s home game tonight versus Boise State, we know we&apos;re entering the winter season and we have lots of good basketball to take us through winter and into spring. Spring of course, especially if you&apos;re a Michigan State fan, means all the excitement and fun of the NCAA Tournament and eventual National Championship game. Yes tonight I&apos;ll watch the Spartans in my basement with the fireplace going as my wife dozes beside me, and hopefully when the NCAA tournament is heating up I&apos;ll be watching the games somewhere down in Florida on spring break with my family. Basketball is also great because unlike football, if you happen to lose (yes, it does happen sometimes) you don&apos;t have to stew about it for a week. Basketball has a couple games a week and you can quickly get the bad taste out of your mouth of losing to say Ohio State, by beating Michigan. See?! 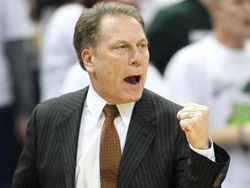 Coach Tom Izzo is ready to lead the Spartan Men into Battle again this season. Mission? Big Ten Champs and the Final Four! Whether you can go to the games at Breslin (a highly recommended good time and a must-do at least once a year for every Spartan Fan) or watch them at home or in your favorite pub, I highly recommend spending your winter and early spring getting into the Spartan Basketball Season. High drama, excitement and lots of fun from college basketball help balance out the snow shoveling, Christmas bills, slippery roads and cold toes. Go Green!